The following video is a brief introduction to our approach to pole bending. It is taken from the Pole Bending Technique DVD Set that we offer for sale. To view this introduction, start the media player below. Watch, as we begin to walk and trot, then lope, then gallop, then run! 1) Lack of respect for the poles. 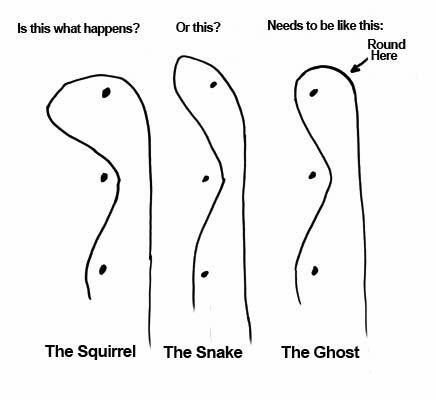 This is so important that after conducting numerous clinics across the country, I have concluded that this is by far the number one cause of downed poles. In my opinion, most riders treat the poles way too casually. By that I mean that when practicing, they act as if a downed pole is just no big deal. They seem to think that the only time they need to concern themselves with downed poles is during a competition. But then it is too late! I would expect a poor turn if I saw a rider ride all the way to the turning point in a forward position without sitting down. I would expect a poor turn if I saw a rider ride all the way to the turning point without asking the horse for flexion until the last instant. I would expect a poor turn if I saw a rider check the horse for the turn and the horse threw its nose in the air to avoid the bit. Look at the photo on the right. Some people would call this a 'run around' turn, but horses can only turn by pivoting. The horse's front feet are on the second pivot spot, and the hind feet are leaving from the first pivot spot. 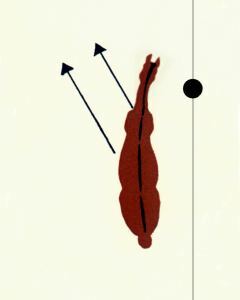 The flexion in the horse shows she is ready to continue the turn, and will be reaching for the third pivot spot. You can pretty much see where those spots should be on the ground. You can also see clearly that the horse is crossing over the back side of the pole, and there will be no sharp angles in the turn - all three pivots will be very close to the same degree of direction change. 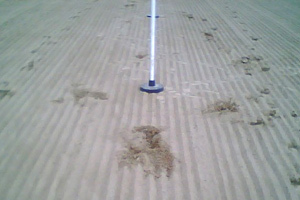 On the left are the footprints of a three-pivot turn. This was the turn near the starting line, and it was a right-hand turn. You can see that the hind feet have landed in the same tracks as the front feet. I happened to notice this pattern just after making a fast practice run on new ground with Perky, Pat's great barrel and pole mare. I reached for my cell phone and took this photo. Look at how closely it matches the above photo of Nicky making that same turn. What a great proof of concept! Here is how the concept of straightness relates to the horse's shoulders: In the photos above, both the horse on the left and my horse Tommy on the right are leaning. Horses have to lean to turn. But look at the shoulders! In relation to the body, one is down and one is up. 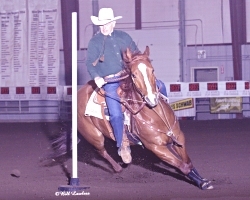 When the rider on the left passes that pole, her horse will feel as if it is falling down and in toward the pole. When Tommy passes the pole, he feels like he is running standing up. To support and encourage that upright position, I am using my inside rein and inside leg to ask Tommy to keep his shoulder up and out away from the pole. I am holding out with the inside rein. I am not pushing with the outside rein. I am allowing him to look where he is going with his head. The inside rein is the active rein, but the outside rein is also there but only to balance his head. Rein the shoulders, balance the head! The best success is achieved by addressing this challenge right from the beginning, when starting the colt, but any horse at any age can benefit from exercises to straighten him. Lateral work, like head-out, shoulder-in, counter-flex, will help greatly to straighten a horse and at the same time will benefit the rider in developing proper use of hands, legs and balance. Use video. Watching videos of your own riding will reveal so much, and you and your horse will benefit for the rest of your lives. A cell phone or tablet will work, but a video camera with zoom capability is even better. If videoing with a cell phone, ALWAYS turn it on its side so the image is wide, rather than tall. 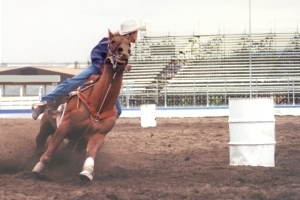 The video camera will reveal the subtle and not so subtle errors: the flip of the horse's head when the rider bumps him in the mouth, the shoulder dropping into the pole or barrel, the short stride, the missed lead, the rider late and behind. There are optimal locations for the camera, depending on what we want to study. I like to see runs viewed from the side and from an end. 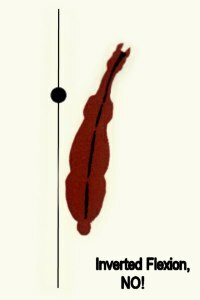 The side view will show the horse's strides and turns, and the end view will show the rider's reining and the horse's flexion, and whether the horse is staying on the ideal track. 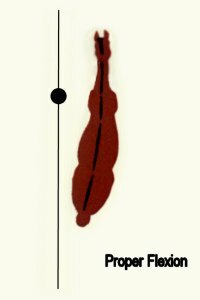 Generally, the most helpful side position is near the middle of the six poles. Adjust the camera zoom so that you can see a little more than two poles in the frame. That will capture all of the horse and rider, and give you the needed perspective as they go through the pattern. There is not a great deal of difference between one side and the other, unless you are looking for something specific. For example, to best see how the horse and rider complete their turns, I prefer to be on the side where the horse will turn the end poles toward me as I'm videoing. To best see how the horse and rider approach and enter their turns, I prefer to be on the side where the horse will turn the end poles away from me as I'm videoing. I also like to see runs from one end or the other. From that position, I like to be slightly to the side so that all 6 poles can be seen in the run. That would be about 5 feet or so off the pole line. You need to use the zoom when positioned at either end so that the horse and rider remain in the frame, neither too far away nor so close that you can't see what is happening. Also, getting up in the air always helps. If you can video down on the pattern, You have a better view of what is going on. Video the horse entering the arena, and continue until the time is announced. View your video in slow motion. You will be surprised at how many things go unnoticed when viewed only at normal speed. I read your pole and barrel help on your web site again today. I believe future riders will be blessed to be able to read this. It should make a big plus in their Pole Bending and Barrel Racing lives. Your explanations are so direct and logical that I was impressed all over again. I am proud of your work and I am pleased that you are teaching this wonderful method to anyone who has the inclination and will take the time to absorb it. We conduct a number of Pole Bending Clinics throughout the year all across the country. We have a Pole Bending Techniques DVD Set that demonstrates the technique and exercises we teach at our clinics. Included are examples of correct technique and also examples of problems and problem resolutions. Several high speed pole bending runs are also included. We offer Pole Bending Video Lessons. We can review your videos of your pole bending runs, and return a report to you with photos from your video frames showing problem areas and recommendations for how to resolve these issues. We have written a review of several models of Pole Bending Bases. We receive numerous questions about the Equipment we use, and we have written an article explaining why we like to use each item. We have written a brief explanation of the importance of the Snaffle Bit. The snaffle bit is a precision tool for establishing high levels of horse handling. You can find all this information in the Horsemanship and Pole Bending section.